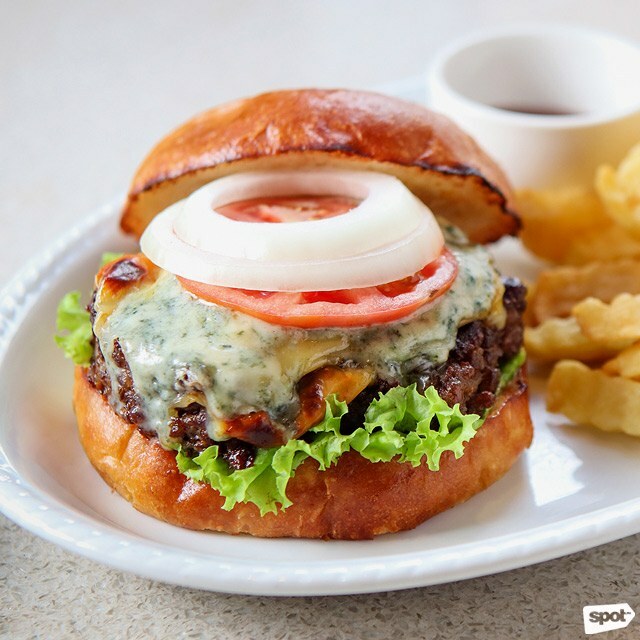 (SPOT.ph) Few things bring more comfort than a perfectly cooked, meaty burger sitting between two soft buns. 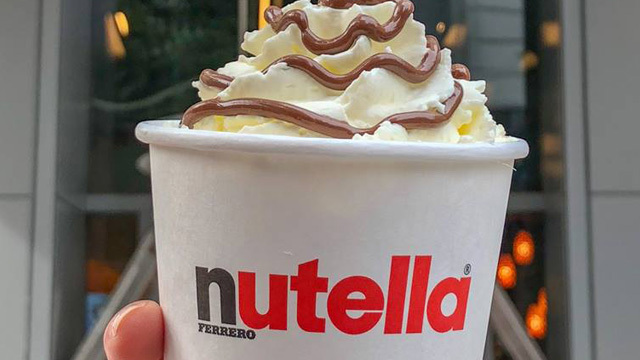 And while you probably already have your no-fail places for a bite, why not take a break from your usual joints? To help you get started, feast your eyes (and stomach) on these glorious burgers from places you least expect to find them. Fans of this Podium Mall classic rejoiced after hearing that Borough has opened a bigger and brighter branch in BGC. And even though they’re known for their creamy mac and cheese and sweet chocolate chip cookies with milk, Borough’s burgers will likewise have you burrowing into them pretty quick. 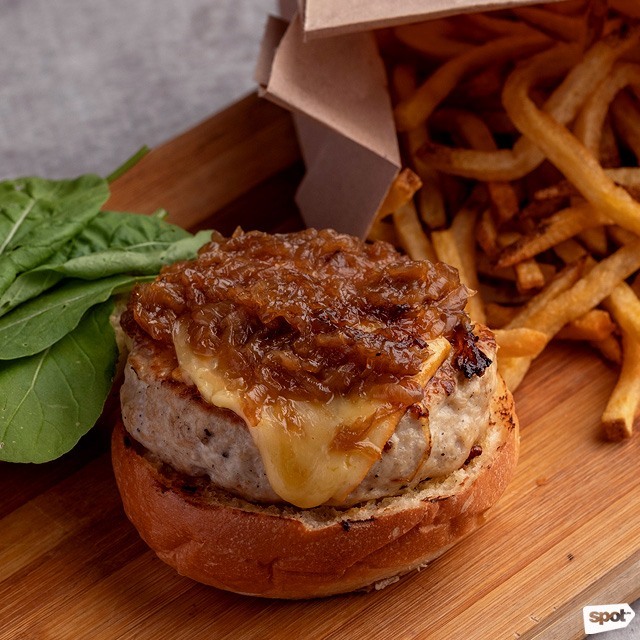 Just take a look at the Borough Pub Chicken Burger (P410)—it might be white meat, but the whole sandwich is packed with smoked gouda, beer-glazed caramelized onions, and arugula on a brown mustard-lined house-made brioche bun. In case you’re looking for an even heftier option, the Grilled Portobello Burger (P430) will do just as well. Of course, there’s also something lighter if you’re just looking for a snack: The California Tuna Burger (P490) puts seared sashimi-grade tuna right in the center, with spicy pickled cucumber, avocado, nori, and wasabi mayo to add a beautiful burst of flavor. Borough is at C2 Bonifacio High Street Central, 7th Avenue, Bonifacio Global City. As you can guess from their name, Karnevore should be on any meat lover’s radar. The place is primarily known for their juicy steaks, but that doesn’t mean their burgers aren’t worth a visit, too. Take, for example, the Classic Cheeseburger (P215/single patty, P235/double patty), available in single or double patty options for when you really want the meat to pack that extra punch. If you need something a little more elevated from the classics, there’s also the Smoking Gun Cheeseburger (P255), which has everything you already love in a cheeseburger, but stuffed with coleslaw and barbecued pork belly to make things more exciting. 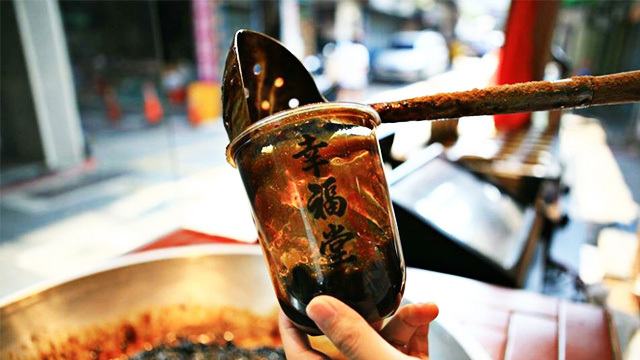 Karnevore has branches at Greenhills, San Juan City; San Roque, Marikina City; and Novaliches, Quezon City. You might know Elbert’s Sandwich Shop as home to some of the most delicious cheesesteaks in the Metro, but here’s a secret: Their burger menu is a highlight on its own. 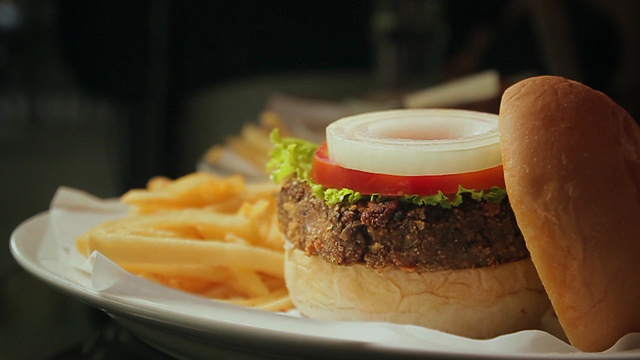 You’ll love the House Burger (P250), a succulent, classic all-beef patty topped with crunchy lettuce, juicy tomatoes, and sautéed onions in between toasted buns. You can also go for their Emmental Cheeseburger (P310), which throws in some pungent Emmental to give you a more flavorful bite. Elbert’s Sandwich Shop is at R2 Power Plant Mall, Rockwell, Makati City. You’ll know a restaurant is serious with their burgers when they offer certified grass-fed beef options—and that’s exactly what The Farm Organics does. Just have a munch of The Farmer’s Burger (P300/local, all-natural; P390/certified organic), with a whopping 200-gram beef patty, organic egg, nitrite-free bacon, tomatoes, onions, cheese, pickles, and organic lettuce. Cheese fans will also delight in the Kesong Puti Burger (P250/local, all-natural; P310/certified organic) that’s made with kesong puti, tomatoes, and lettuce. For something a little more special, why don’t you try the Avocado Burger (P260/local, all-natural; P320/certified organic), which is stuffed with creamy avocado and earthy alfalfa sprouts? We recommend splurging on the certified organic beef—you’ll really taste the difference. The Farm Organics has branches at 2/F Commercenter, 1780 Commerce corner Filinvest Avenue, Filinvest City, Muntinlupa City and R2 Power Plant Mall, Rockwell, Makati City. Wildflour Café + Bakery’s little sister, Little Flour, deserves some time in the spotlight, especially with their wide array of lunch options ranging from filling rice bowls to hefty sandwiches and soups. 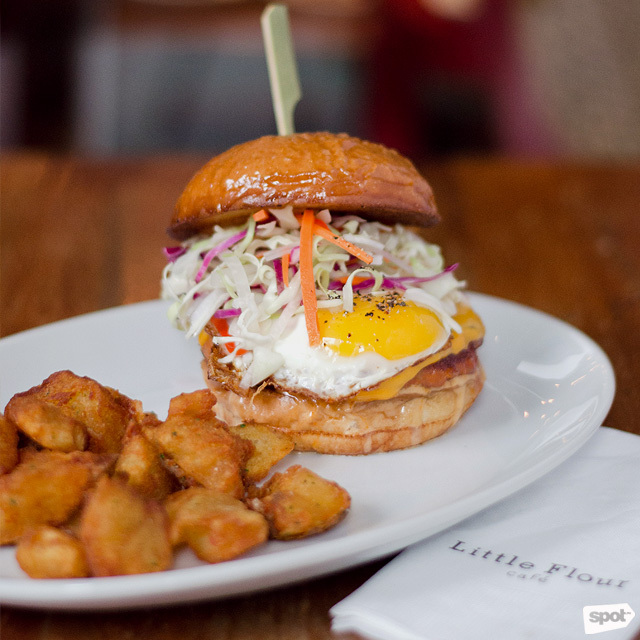 Their incredibly filling Breakfast Burger (P420), packed with chorizo, hoisin mayonnaise, cheese, pickles, and a sunny-side-up egg has the power to make your morning (or your whole day, really). If you’re looking for something a little more classic, don’t leave yet because they also whip up a pretty mean California Burger (P420), complete with a thick all-beef patty topped with grilled onions and a slab of sharp cheese. Their burgers come with a side of potatoes, so you get the perfect pair each time! See a list of Little Flour branches. 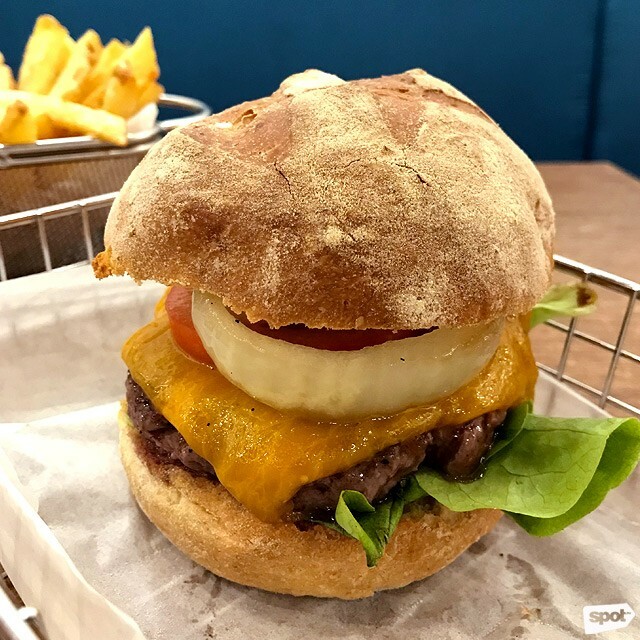 The Fat Seed Café + Roastery is a great go-to for good eats at UP Town Center, but in case you haven’t tried out their burgers yet, here’s a word of advice: The Fat Seed Burger (P395) is a crowd favorite. 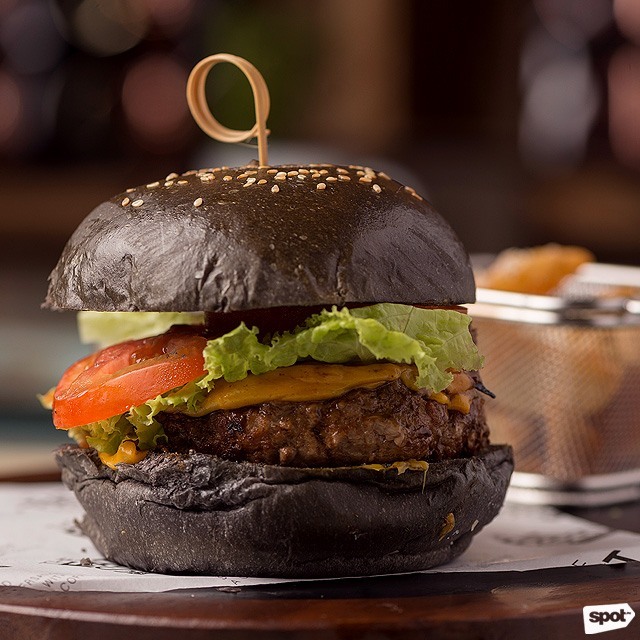 Don’t be intimidated by its black brioche buns because they’re actually soft and buttery, and perfect with its medium-done, thick beef patty. But if you still prefer your buns to be in that timeless golden-brown hue, The Fat Seed Sliders (P395) are fun-sized versions that’ll do just the trick. They even offer a Southern Fried Chicken Burger (P330), which is packed with a crunchy buttermilk fried chicken fillet, herbed cream cheese, pickled onions, and lettuce and tomato slices. It’s no secret that Flatiron 1771 is known for serving familiar favorites that are fresh off the grill, so it only makes sense that their burgers are a must-try. The Flatiron Burger (P566)’s patty is made with U.S. beef chuck seasoned to perfection in a special homemade herb butter, and topped with cheddar cheese, grilled tomatoes, and onion. They’re all stuffed in between two heavenly, fluffy potato buns. There’s also the Blue Cheese Burger (P586), which puts a smoky grilled-beef burger and a generous drizzle of blue cheese front and center. Flatiron 1771 Restaurant and Bar is at G/F Uptown Place Mall, 36th Street corner 9th Avenue, Uptown Bonifacio. If you’re already a fan of Mamou’s steaks and truffle cream pasta, then their burgers should definitely be on your radar, too, for their equally heartwarming appeal. 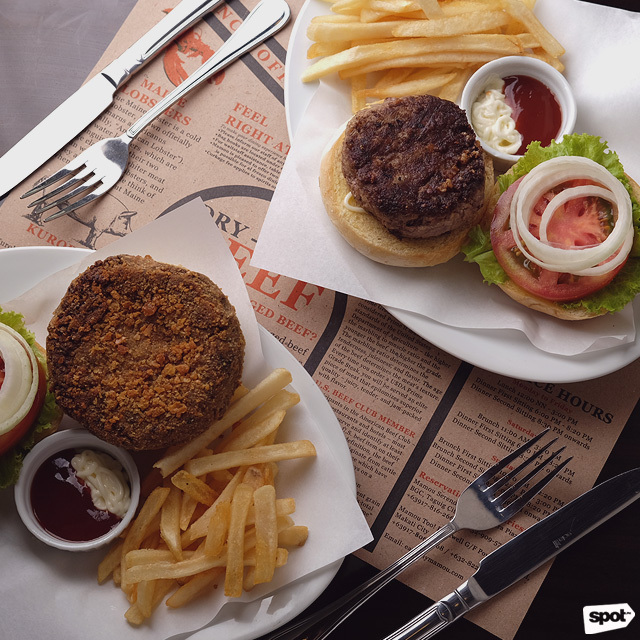 Whether or not you’ve had a bite of beef at this casual steak place, we’re sure your mouth will water at the mere sight of the Dry Aged Burger (P585) that features a delectably chunky all-beef patty. A lighter option is Mamou’s Shroom Burger (P495)—the earthy Portobello and shiitake mushrooms will amaze you as both come together to result in one rich burger patty. You wouldn’t think it’s vegetarian at all! Mamou has branches at G/F Power Plant Mall, Rockwell, Makati City; G/F Serendra, Bonifacio Global City; and G/F Ayala Malls The 30th, Meralco Avenue, Pasig City. If you didn’t know, Australian-inspired joint Bondi & Bourke is a haven for breakfast food aficionados and steak lovers. Apart from that, their burgers deserve a lot more love, too. They’ve only got two on the list, but both are sure to satisfy any meaty cravings you have. First up is The Australian Burger (P695), which highlights the richness of thick, juicy Australian beef that’s worth every single morsel. Meanwhile, the Beef Burger (P595) is a heavenly medley of beef, fried egg, bacon, and a surprise layer of pickled beets that pack a powerful punch. Bondi & Bourke has branches at G/F Cattleya Condominium Building, Salcedo Street corner Aguirre Street, Legazpi Village, Makati City; and Forbes Town Center, Burgos Circle, Taguig City. 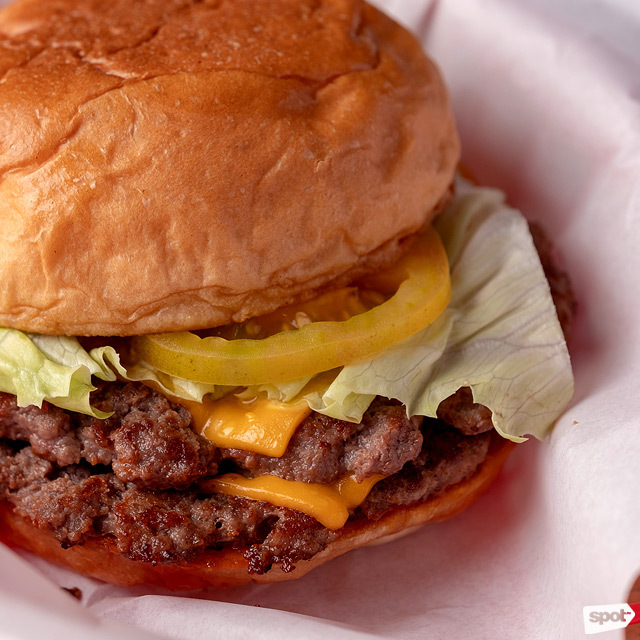 While NoKal seems like a spot you’d want to grab some after-work drinks with friends at first glance, that isn’t a reason not to try their dishes—and yes, we’re talking about their burgers. The Cheeseburger (P295) is a level up from the classic: Two beef patties sandwiched between layers of melted cheese, and inspired by the burgers you can find at Shake Shack and In-N-Out. If you don’t want to tackle the double-decker version, there’s an alternative Jr. Burger (P220) with a single patty. NoKal is at 8464 Kalayaan Avenue, Makati City.